Death by Sugar (Sweetened Beverages)? 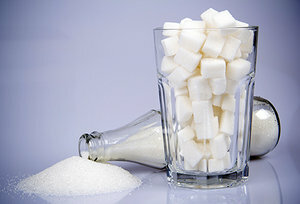 Home » Blog » Death by Sugar (Sweetened Beverages)? Sugar-sweetened soft drinks, fruit juices and other beverages represent a growing health danger that goes far beyond simple cavities and poor energy; a recent analysis suggests regular consumption of sugary drinks can indirectly lead to death– yes, death. Sound far-fetched? Not really, and here’s why: According to the researchers, who analyzed data from studies investigating the impact of sugar-sweetened beverage intake on body-mass index (BMI) and diabetes – and the resulting impact of BMI on cardiovascular disease and cancer, nearly 200,000 deaths worldwide can be attributed to drinking sugar-sweetened beverages. And that’s nearly 200,000 deaths every year. Specifically, the researchers estimated that consumption of sweetened drinks contributes to 133,000 deaths from diabetes, 45,000 from cardiovascular disease, and 6,450 from cancer on an annual basis. Sure, the researchers don’t establish a direct connection, but keep in mind two things: 1) Excess sugar intake is associated with higher BMI and diabetes risk, while higher BMI and diabetes are risk factors for more serious health conditions and mortality; and 2) Their analysis wasn’t a small one; they relied on data from 62 national dietary surveys and more than 600,000 people over a 30-year period. Need any more reason to stay away from the sugar when you’re thirsty this summer? Click here to learn more about the dangers of sugar-sweetened beverages, and here to discover the benefits of the alternative simple glass of water.